Europe’s election: Lessons for the U.S.? (CNN) — The calm and cautious François Hollande, who dramatically wrested the French presidency from Nicolas Sarkozy on Sunday, faces immediate foreign policy challenges, analysts say. Hollande strides onto the world stage with major events over upcoming days and weeks — the Group of Eight meeting at Camp David, Maryland, and the NATO summit this month and a G-20 meeting set for Mexico City, and a European Council meeting in Brussels, Belgium, in June. The rule of thumb about judging the effectiveness of a president after his or her first 100 days in office could be changed to the first “100 hours” in Hollande’s case, said Heather Conley, senior fellow and director of the Center for Strategic and International Studies’ Europe Program. Hollande became France’s first Socialist president since François Mitterrand left office in 1995 as he swept to election victory over the incumbent Sarkozy, one of the most America-friendly French presidents in decades. The result is likely to reverberate across economically hard-hit Europe. 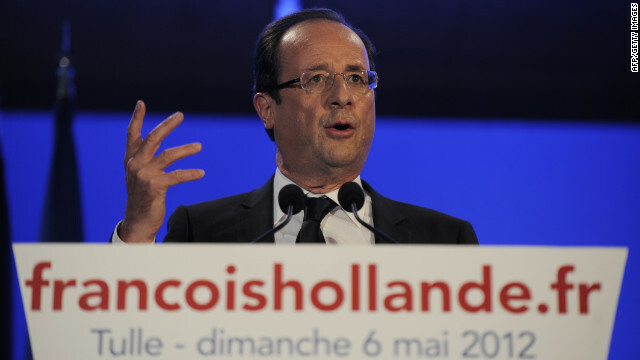 Hollande has been critical of the austerity policies central to European bailout deals for troubled economies there. But his leadership is expected to make an impact in Afghanistan as well as Turkey and the Middle East. European markets quickly recovered from an earlier sell-off Monday following national elections in France as well as Greece that sparked concern about the future of planned austerity measures. U.S. stocks were mixed Monday amid reignited concerns about Europe following the elections in France and Greece. The Dow Jones industrial average lost 32 points, or 0.2%, the S&P 500 shed 1 point, or 0.1%, while the Nasdaq composite rose 2 points, or 0.1%. “A change in leadership brings uncertainty because you don’t know exactly what you’re getting into,” said Ryan Detrick, senior technical strategist at Schaeffer’s Investment Research. Stephen Flanagan, the Henry A. Kissinger chair in diplomacy and national security at the Center for Strategic and International Studies, underscored the sense of uncertainty. Hollande doesn’t have a “big foreign policy track record,” he said. “Hollande has been mostly a party functionary,” he said. Danielle Pletka and Gary J. Schmitt of the American Enterprise Institute wrote that Hollande’s “campaign stayed away from talking about foreign policy almost altogether.” Only four points of Hollande’s 60-point agenda “touch on foreign affairs,” they said. “Contrary to those who believe Sarko was the George Bush of France (‘dragging’ Obama into Libya, taking a hard line on Iran’s nuclear program), and have hopes that the long-time head of the French Socialist Party will take a severe turn to the left, Hollande is likely to disappoint,” they said. “I think he’s going to be a little bit more cautious and circumspect about international intervention,” Flanagan said. During the campaign, Hollande also raised questions about Sarkozy’s decision in 2009 to place French troops under NATO command. Hollande can expect NATO leaders to urge him to change or soften his position when he attends the NATO summit in Chicago this month where the focus will be on Afghanistan. But if Hollande commits to disengaging troops without a reasonable transition, “it’ll make a very bad first impression with his NATO allies,” Flanagan said. Flanagan said relations between Turkey and France have been tense because Sarkozy was “dead set” against Turkey becoming a member of the European Union. He said Turks also viewed Sarkozy as supportive of legislation making the denial of the Armenian genocide a crime, a stance they vehemently opposed. Hollande is expected to be a bit more open-minded on Turkey, Flanagan said. Marc Pierini, a former European Union career diplomat, wrote in a commentary for the Carnegie Endowment for International Peacethat France also needs a “fresh start” in the Arab world. “Hollande will now have to rebuild decent relations with largely unknown political partners — Islamists now dominate the political game in Egypt and Tunisia for example. He will also need to work with the Arab world more through the EU framework, rather than through a strictly bilateral one, which his predecessor preferred but did not work,” he said.